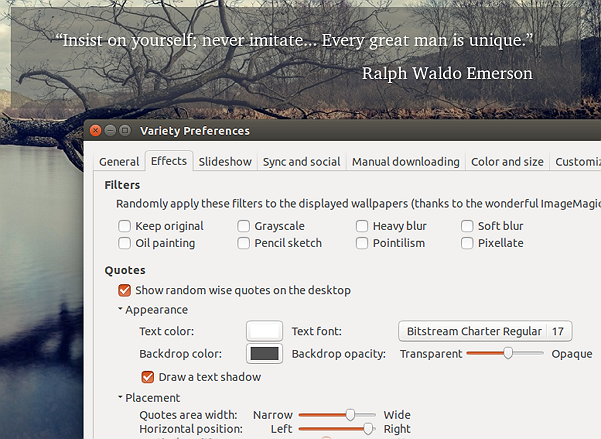 Variety is a features rich wallpaper manager (changer) that is available for Ubuntu and many other GNU/Linux distributions, and it’s probably the one that’s in active development that runs smoothly on Ubuntu 16.04 LTS. I said that because even though others of its kind, such as ‘Wallch’, which are also available for Ubuntu (from older versions to all the way up to 16.04 LTS), they don’t run that smoothly in recent versions of Ubuntu because they’re simply outdated versions. Variety basically lets you change your wallpaper automatically, using both the locally saved wallpapers to using Internet sources such as from Bing, Flickr, Reddit, NASA and many more. You can also manually add a source to the existing list as well. One of its other cool feature is its ability to display quotes on the wallpaper. Variety provides lots of customization options both concerning the quotes (size, location, change the online sources etc) and other general settings. It can also display a nice clock on the wallpaper, but it somehow failed to display the Date properly (Variety does provide a bit of a workaround on how to get it to work. I tried some of the suggestions, but they didn’t work, but it’s a not much of a useful feature for me anyway). And in recent times, Variety added a new major feature called the ‘Variety Slideshow’. This basically opens up a slideshow either in windowed mode, full-screen or as a desktop wallpaper which is pretty nice at times. That’s it. Once the installation finishes, search for it in Dash for opening it (it’s set to start with the desktop by default). Whenever you want to change the wallpaper manually, click on its icon on the Tray area and select ‘Wallpaper Selector’ which should open up a horizontal thumbnail bar at the bottom of your screen (on a side note, I accidentally kept it open for about a minute, and Variety started to use about 25% of my CPU all of a sudden, for no reason. But as soon as I closed the ‘Wallpaper Selector’, it went away). You should also be able to open up the ‘Preferences’ by clicking on its icon on the the system tray area as well. Variety is also available for other distributions as mentioned earlier. Please visit its home page for install instructions on those systems. many people use it now. i do too, and it works great. sometime i forget it is there, nothing fancy .. it does what it is supposed to do.